Demi Lovato On Body Image: "Staying Strong Is Worth It"
In 2010 former Disney popstar Demi Lovato shocked her fans by admitting she had an eating disorder and a problem with cutting, and took time out of her career to go into treatment. All of a sudden she became an inspiration for so many other young girls who were struggling to also get help and realize there is no shame in struggling with either of these issues. In 2012, after a period of recovery and slowly getting back on her feet with her music, she tweeted that “Most models are thinner than 98 percent of Americans. Instead of trying to change our bodies, how about we try to change our culture?” on National Eating Disorder Awareness week. In 2014, just after the annual MTV VMAs, she showed yet again how far she has come on her journey to body acceptance in a two year span. 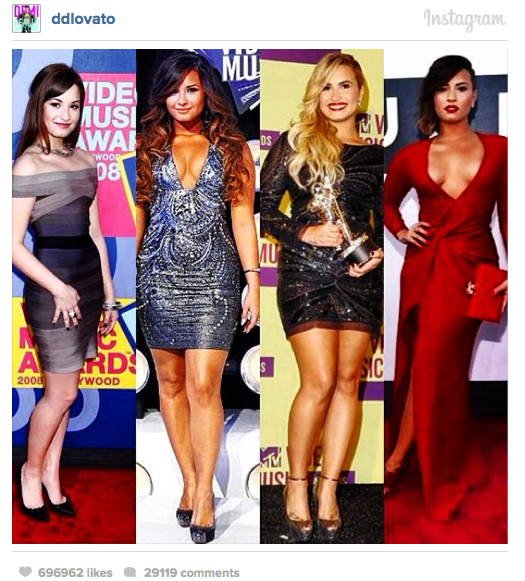 Demi posted a pic of herself on Instagram at 4 different VMA awards shows over the years and spoke not about her style evolution, but her healthy mindset. “This picture makes me feel so many mixed emotions.. I remember the day I wore the dress in the very first picture. I remember asking for spanx to flatten my stomach because I use to feel so heavy and ‘fat’,” she starts off. She is not alone in feeling that way, yet her words can be a powerful way to empower other young women to change their perception of themselves, given that she is a celebrity with quite a bit of influence. “It TRULY just goes to show you that your perceptions can lie to you,” she continued. “OR they can make you learn to enjoy life. Fortunately looking at the picture of myself in the red dress yesterday, I not only feel so grateful for the love and support I’ve had from fans, friends and family, but… I also feel.. beautiful. Calling herself beautiful and not feeling guilty or ashamed is a strong statement to make. We live in a culture where we are subconsciously taught not to value ourselves unless we look like the images in a magazine or in a commercial, and to achieve that look we must spend a lot of time and energy changing who we are. Studies show that only 5% of women naturally possess the body type portrayed in advertising and media, so that means the remaining 95% of women are walking around feeling unhappy about themselves. Even celebrities fall into this later category, as Demi Lovato has shown. But her journey to recovery, which is still an ongoing process as with a lot of addicts and sufferers, shows that it starts with yourself and your mind. Yes girlfriend, and amen! Staying strong in indeed worth every ounce of your energy. We hope this message will empower you to live your life knowing your worth isn’t measured by any external value, but by what you have inside you. When you nurture and allow that to grow, your self-image will follow suit.